My friend Daphne Bramham is a columnist at the Vancouver Sun in Vancouver, British Columbia. 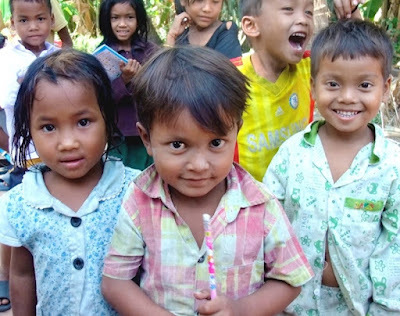 On a recent reporting trip to Cambodia she learned a simple lesson about want and need from a little Cambodian boy and his pencil. A tiny boy with nothing would seem an unlikely teacher, just as Cambodia with its history of genocide and pain would be an odd place to learn a lesson in grace. But four years ago, I did learn a lesson from a boy in a remote Cambodian village, where only days earlier flooding had washed out the dirt track that is known locally as a road. Pencils and notebooks are precious things in subsistence farming communities. They cost money, and money is scarce. But without pencils and notebooks, children are hobbled in their learning. So, I’d spent the equivalent of a few dollars to buy a big bucket of pencils, a pencil sharpener for the school, and an armful of notebooks. As I passed them out, children smiled shyly and said quiet thank yous in Khmer. I was sure that the tiny boy had been passed over. I tried to give him a pencil, but he shook his head. No. Why not? Why wouldn’t he take one? My guide and translator from Plan International stepped up to help. “I already have one,” the little boy said, pulling his new pencil from his pocket to show me. He was happy with one. It was his fair share. I thought of him this Christmas season as I flipped through flyers, websites and magazines looking for gift suggestions and fretting about what to buy, whom to buy for (building manager, caretaker, newspaper delivery guy, the nephew’s girlfriend who I’ve never met? ), and how much to spend. It wasn’t solely altruistic either. I’ve been asked a few times what I want for Christmas, and I draw a blank. I don’t need anything, really. The few things that I really want (like less time at the computer and more time with people) are not things that anyone can buy. But it is the season of giving. So, I keep flipping pages, searching websites and marching up and down crowded store aisles searching for that perfect something for the ones on my list. In a culture of plenty, the recommended gift lists suggest that there is no limit to how much we should spend. Even stocking stuffers on many of the lists are no longer limited to things like oranges, nuts, candy, socks and dollar-store puzzles. There are, of course, lists of “useful” gifts for those who have everything. Among those I’ve seen are: a $130 brass pen described as “super compact and sleek;” $200 pruners for that special gardener; a $1,000 stand-up mixer when the same version in a different colour is half the price; a $30 box of “vintage-style” fireplace matches; and a $50 box of popcorn with truffle salt. I do pity harried parents searching frantically and often futilely for the must-have toy of the season that tops their children’s lists. But I pity more the parent who must explain why sometimes even if a child is very, very good, Santa can’t bring them what’s on their list. Does anybody really need/want this stuff, or even some of the things that we buy? Read the rest of Daphne's column.